It is very easy when playing a wargame to lose sight of the objectives. When playing a campaign it is easier to focus on what needs to be acheived rather than the obvious quick results. When playing a game within a campaign to other people’s instructions it focuses the mind even more. When the game involves a card-based order system this complicates the situation. This was my latest challenge, west of Arnhem on 18th September 1944. The British troops [green tokens] from 1st Airborne Division have an overall objective to push through the town towards the Arnhem road bridge in support of the troops holding the bridge. They were also tasked with doing maximum damage to enemy armour. The Polish battalion [yellow tokens] was in defensive mode, protecting the southern end of the railway bridge across the Rhine. The Germans [black tokens] were initially on the defensive. Their objective was to destroy as many allied units as possible, and to retake the railway bridge. 1 HQ Platoon, 3 rifle platoons, 1 MG Platoon. 11 rifle platoons, 1 MG platoon. Off-table artillery support from two batteries of 75mm Howitzers of 1st Air-Landed Light Battery Royal Artillery. 9th SS Armoured Recce Bn. 3 platoons SdKfz222 scout cars. 2nd PanzerGrenadier Bn, 9th SS Panzer Div. 9 rifle platoons, 2 mortar platoons, 1 panzerfaust platoon. 3rd PanzerGrenadier Bn, 9th SS Panzer Div. 1 HQ platoon, 11 rifle platoons, 1 MG platoon. I use the Memoir ‘44 game system, with some house rules for equipment types not covered in the game. For example, light armoured cars move like supply trucks but fight like half-tracks. Off-table artillery is activated by “barrage” cards, and if appropriate by artillery order cards. For campaign games I allocate command cards by dividing the number of platoon elements by three. As casualties are suffered or reinforcements arrived, the hand of cards is recalculated. This reproduces the friction of battle: as casualties are suffered the number of command choices is reduced. Victory points are calculated by the number of company units of the smaller force divided by two. But points are won by achieving goals for the battle or campaign as set by the remote generals.For this battle, Victory points were set at 4. 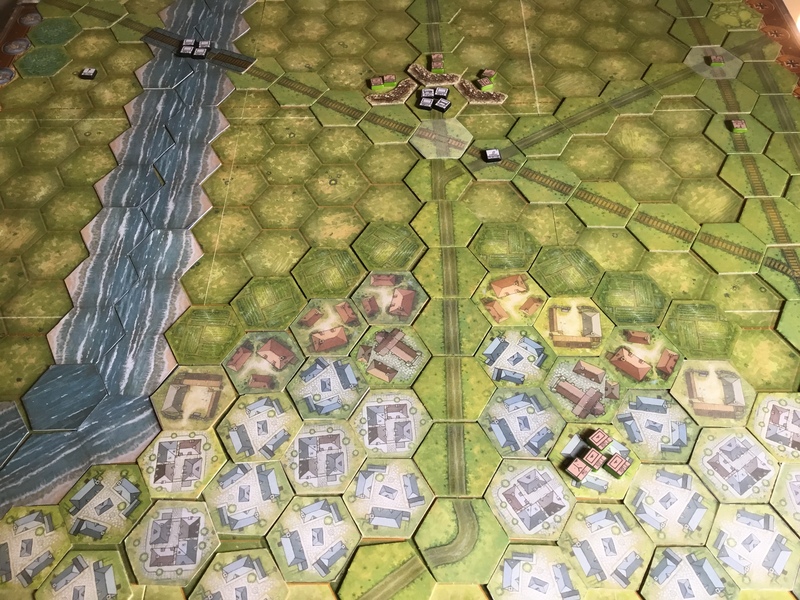 Allies win 1 VP if the enemy armoured unit is destroyed, and 1 VP for each company that leaves the board by the eastern edge, towards the Arnhem road bridge. Germans win 1 VP for every allied company destroyed and 1 VP for possession of the rail bridge. The South Staffordhire’s opened the action with a surprise assault against about a dozen light armoured cars (SdKfz222) in the yard of the Arnhem railway station. Leaving three or four ablaze they then moved on into the town itself, heading for the road bridge. South of the river the 3rd PzGren Bn charged the Polish paras south of the bridge. The Poles fell back with light casualties. They called in artillery support which pounded the Germans and caused heavy casualties. The Germans attacked again at close range, this time inflicting heavier casualties, and the Poles retreated, followed up by the victorious Germans. One Polish platoon counterattacked, inflicting light casualties on the Germans and halting their chase. Back to the north of the Rhine 2nd Bn commenced mortar fire on the KOSBs. Light casualties were inflicted. The KOSB mortars replied, and the Germans lost about one third of their number. The Germans’ answer was to advance to closer range and use the rifle platoons against the KOSBs. One British company fell back with light casualties and another took several hits. South of the river the 3rd Bn kept up the pressure on the Poles, effectively wiping out two of the three companies defending the bridge. 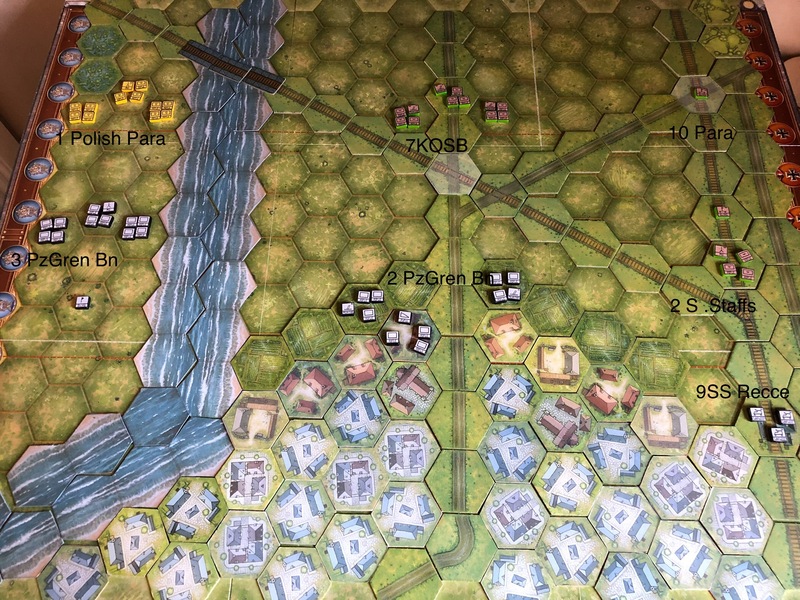 \With the situation south of the river getting desperate the KOSBs pressed on with their objective. The mortars fired again causing very heavy casualties on the enemy and opening up the possibility of breaking through. In the Polish sector the Germans attacked again and drove the remaining Polish paras away from the bridge, taking control of the railway line. The KOSBs pushed eastwards and fired at the defending Germans with minimal result. The Poles charged the Germans on the railway line and retook the south end of the bridge. The Germans now launched an all-out assault, wiping out the last of the Polish defenders and driving the KOSBs back. The KOSBs began to dig in where they stood. In the final act the Germans moved their last remaining company south of the river onto the railway bridge, achieving their objective. Eventually both sides were reduced to only 4 command cards. Not good news for the newspapers on either side! Previous Previous post: The “Good Old Days”?